Improve digging power and performance with the rear stabilizer attachment. Frame-mounted at the rear of the loader, this attachment increases power and force of a backhoe or tree spade attachment. When attached to a Bobcat® loader, the rear stabilizer attachment increases the digging capability by transferring the weight of the loader to the attachment, giving the attachment more force to power through the dig. Street pads protect sensitive surfaces from damage and grouser bars help keep the loader from being pulled toward the work area. The rear stabilizer attachment also helps by leveling the loader on uneven terrain, keeping the machine stabilized in any conditions. 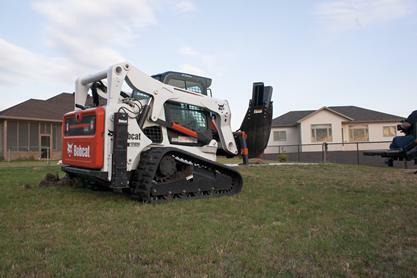 Increase digging performance while maintaining stability with the rear stabilizer attachment.